My dad can make an Indian “sabji” out of just about any vegetable. A “sabji” is basically an Indian vegetable stir fry with aromatic spices like cumin, coriander, turmeric, cayenne pepper, mustard seeds, etc. Traditionally, vegetables like potatoes, cauliflower, peas, spinach, squashes, cabbage, etc. are used in Indian cooking. 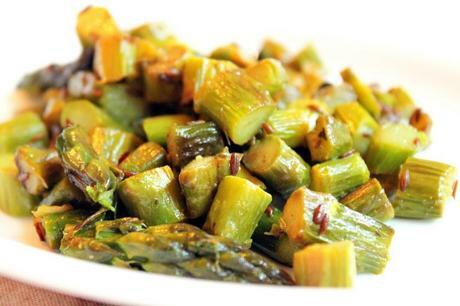 Since those spices make the traditional Indian “sabji” vegetables taste amazing, why not asparagus? I mean seriously, why not. 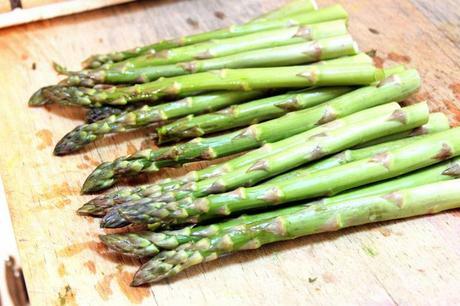 Asparagus is a gorgeous vegetable, especially when it’s in season, which it is right now. And the flavors of cumin, lemon, ginger in this dish just elevate it to a whole new level. Which is basically what this is. You can serve it as a side dish, as an appetizer, or you can even use it as a “sabji” if you prefer. You can even save the leftovers and eat it the next day as a snack (which is what I did). It’s super simple to make, and it’ll be ready in less than 20 minutes. I promise you won’t be disappointed! The DirectionsStep 1: Cut the asparagus into bite sized pieces. Heat the oil, and add the cumin seeds. Once they begin to pop, add the ginger. 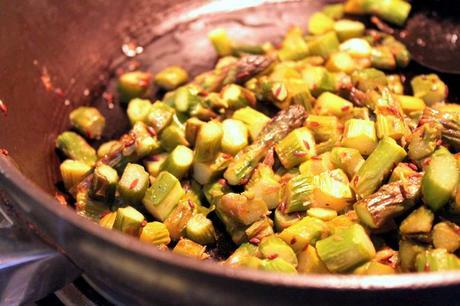 Fry for a few seconds, then add the asparagus. Step 2: Add salt, cook uncovered for ~5-10 min, stirring.Step 3: When the asparagus begins to caramelize and brown, add the lemon / orange juice to deglaze the pan. As the juice begins to evaporate, turn the heat off. Allow the juice to soak up for a few minutes. Sprinkle with black pepper, stir, and serve. Don’t you love that this recipe has 3 steps? And the best part: this ENTIRE recipe has ~200 calories, and 10g fiber. 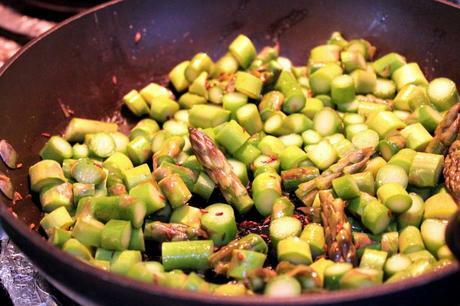 And this recipe makes a LOT of asparagus, definitely enough to serve a couple people. Which means, you can enjoy this virtually guilt-free. 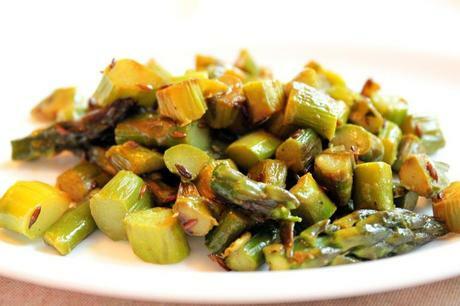 Indian Style Asparagus with Lemon and Cumin By Anjali Shah @ The Picky Eater Makes 4 servings, entire recipe: 200 calories, 10g fiber. The Directions Step 1: Cut the asparagus into bite sized pieces. Heat the oil, and add the cumin seeds. Once they begin to pop, add the ginger. Fry for a few seconds, then add the asparagus. Step 2: Add salt, cook uncovered for ~5-10 min, stirring. Step 3: When the asparagus begins to caramelize and brown, add the lemon / orange juice to deglaze the pan. As the juice begins to evaporate, turn the heat off. Allow the juice to soak up for a few minutes. Sprinkle with black pepper, stir, and serve.